Making a Framed Toilet Paper Advent is a fun way to countdown to Christmas. Keep track of the shopping days until Christmas and how many days are left before Santa will place presents under the tree. An Xmas countdown is a merry way to stay organized and on top of things during the hectic holiday season so start making yours now. Follow the directions below and in no time flat you'll be ready to count down the days in style. Empty toilet paper tubes - the uses for them seems to be endless and that surprises me. Who would have ever thought that something so trivial could be used for so many other uses. The world of recycling never ceases to amaze me. This festive Xmas countdown calendar was extremely easy to make, not to mention economical. It is simple, classy, and functional all wrapped in one. It is definitely a winning craft idea. 1. Paint the picture frame green or any color that tickles your fancy. 2. Get a piece of cardboard that fits perfectly in your frame and paint it the same color as your frame. 3. Take your toilet paper tubes and cut them into one centimeter sections. Make 25 of them. 4. 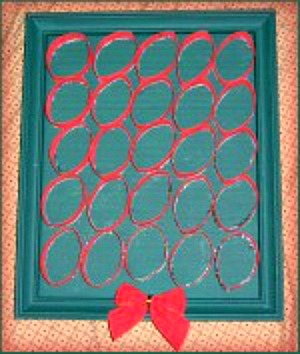 Arrange them on your frame so that they fit well and then hot glue them in place. 5. Add a little red bow for embellishments. 6. Then fill the toilet paper tubes with candy or any other little treat you would like. I think it would be best to add numbers to each tube too so you can easily countdown to Christmas. That's it, folks! You now have a festive, functional, fun advent calendar to help you countdown the days till Christmas. Here are some other craft ideas for kids that you might like. Just click on the picture to view the craft.